The girls and I are currently on the road. Mr. Fuji went to Japan on a business trip, so the Fujilings and I decided to go and have our own adventure instead of sitting around at home! We drove 916 miles from our house to Wenatchee, Washington (in north-central Washington) to visit my brother for a few days and explore the surrounding areas. Then we got back into the car and drove another 189 miles to Bellingham, Washington (just south of the Canadian border, on the coast), to visit my sister-in-law and her family. 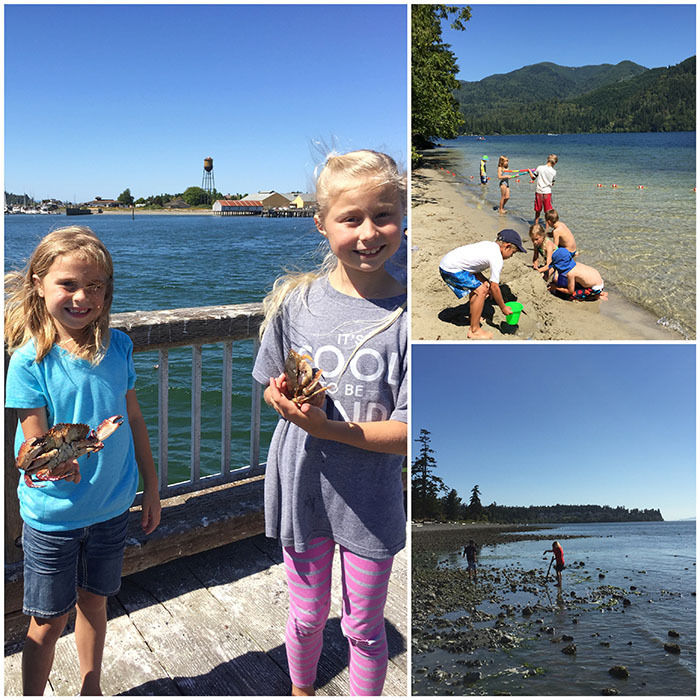 The girls had a blast playing with cousins and doing everything from going clamming to swimming in a lake. Yesterday we got back into the car (sniff, sniff) and started the long drive home, driving 299 miles to Kennewick, Washington (in southeastern Washington along the southwest bank of the Columbia river), where we crashed for the night. We are up and ready to tackle the remaining 652 miles to get home. When we get home we will have driven 2,056 miles, not including the miles we have driven in between to go and do things! That’s a lot of car time. The girls are fantastic travelers, and get better with every trip, but that doesn’t mean I don’t have to have a few tricks up my sleeve. When it comes to car trips, snacks are extremely important. I pack a huge assortment of choices, which usually includes fresh berries and grapes, carrot sticks, sugar snap peas, crackers, hummus, bagels (Bug is a bagel addict), nuts, and granola. Yes, granola. I’ve mentioned my granola obsession before, but just in case you missed it, here it is again: I love granola. Big time. When I was little my mom used to make the most incredible peanut butter granola. Just thinking about it has me wondering if I have that recipe hidden away somewhere . . . Mom, wanna send it my way? 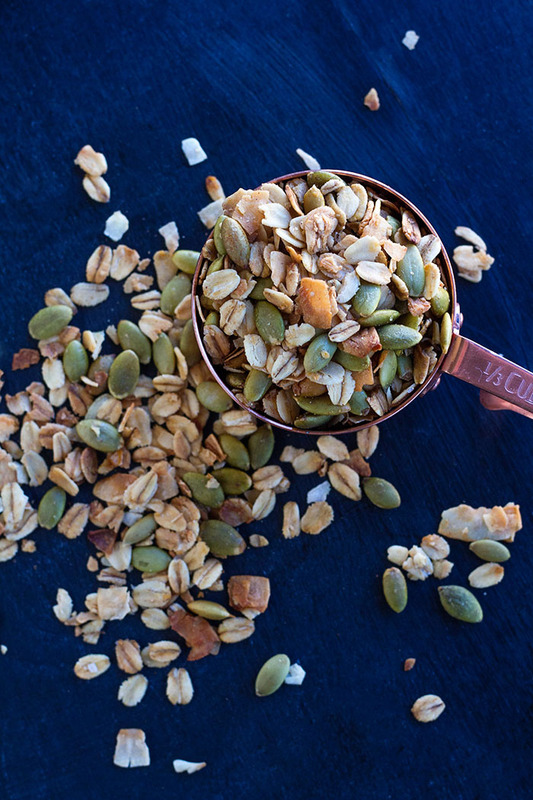 Granola makes a fantastic treat for road trips because it’s easy to make a big batch ahead of time, it’s easy to eat with your hands, it packs well in virtually any container, and you can always sprinkle it on some yogurt to shake things up! You can also pack disposable cups and spoons and a bottle of almond milk, like we do, and help yourself to some granola and milk when you feel like it. Because you can. But you do have to choose the right granola. (You didn’t realize that there are different types of granola for different situations? Well, now you know!) It needs to be a drier granola, so that it doesn’t stick to your fingers (or your car for that matter!) and make a mess. 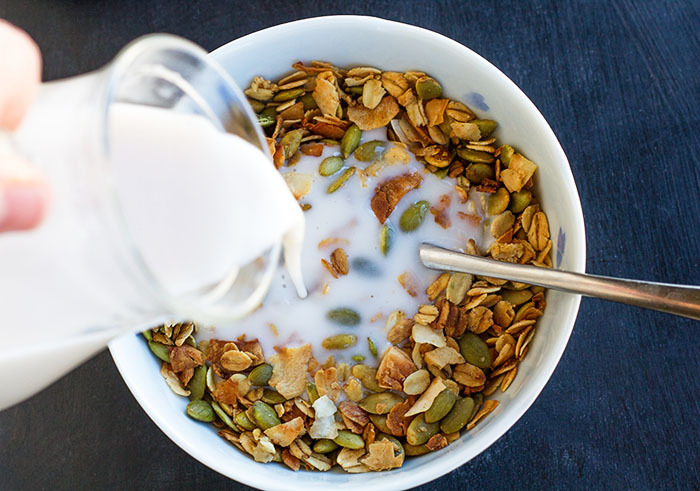 This granola recipe is one of my favorites and I have been making it a lot lately. It’s simple, but surprisingly addictive, and it is perfect for packing to take on a road trip! Rolled oats, pepitas (pumpkin seeds), and flaked unsweetened coconut seasoned with maple syrup, vanilla, and cinnamon . . . what’s not to love? Unfortunately, I went a little hog wild on the granola during the first half of our trip, and it is g-o-n-e, so let’s just hope and pray that I survive the last 652 miles today without it! Gulp! 2. Measure all of the ingredients into a large mixing bowl, then toss and stir until everything is well incorporated. 3. Spread the granola on a parchment paper-lined rimmed baking sheet. 4. Bake the granola for about 25 minutes in the preheated oven, tossing it every 10 minutes, until it is toasted and lightly browned. 5. 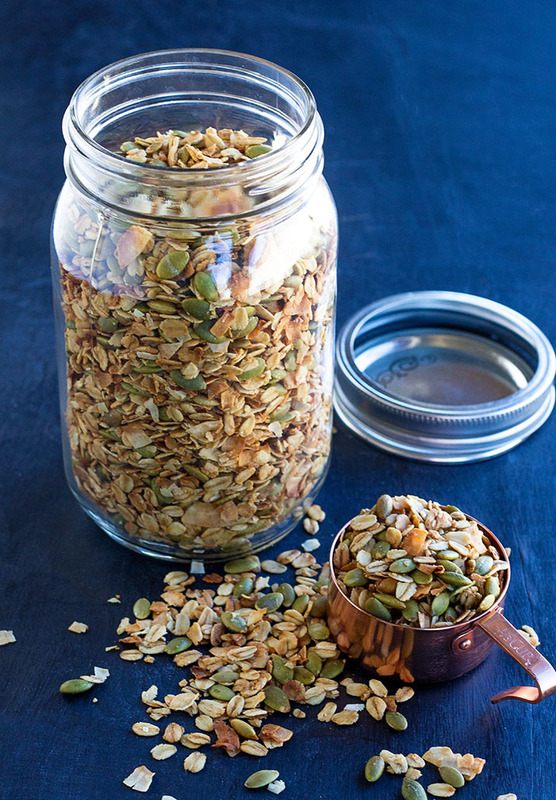 Allow the the granola to cool for at least 15 minutes before serving or transferring it to a storage container. The granola will firm up a bit as it cools. I made the startling and wonderful discovery that I had all the ingredients, save pepitas, and substituted honey and ghee for maple syrup, and it came out very tasty. Thanks for sharing! I am so glad! Thanks for taking the time to come back and comment! The coconut really makes it special. I’ve stocked up. 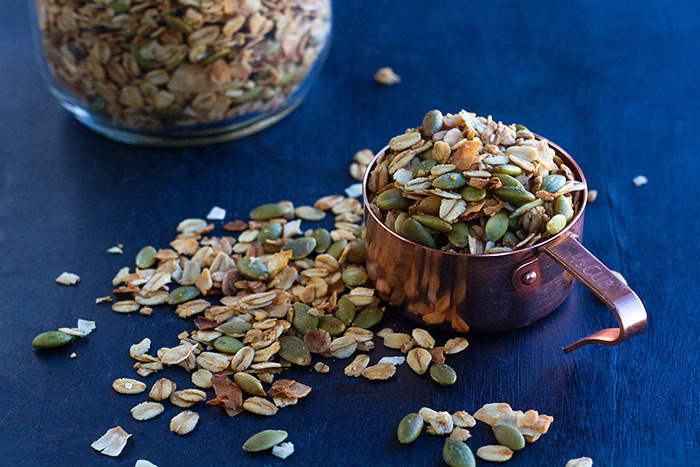 Love me a granola recipe! FYI the “c” is missing from coconut in the recipe part! I just made a second batch. That makes 2 batches in about 5 days. We are big fans. This one is a winner.